This Harley Davidson Quad Bike Is A Must Have! Anyone? - Muscle Cars Zone! 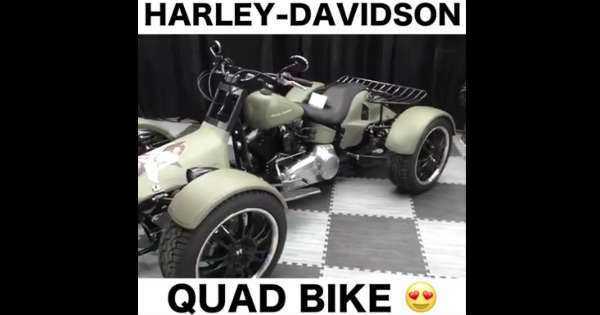 This Harley Davidson Quad Bike Is A Must Have! Anyone? The classic bike manufacturer, and surely one of the best out there, has marked the US and its history. Known for its high quality bikes, in fact they hold up so nice that people still have the original condition of the classic bikes. They have not stopped making bikes to this day, and some of their all time best bikes are the 1915 11F, the 1983 XR-1000, the 2010 Dyna Wide Glide, and the 2006 VRSCSE2 etc. But they have just produced something brand new for them, a Harley Davidson quad bike. How cool is that? This amazing looking quad bike can be seen in the following video as it was first presented to the audience. It has the navy-green color along with the black frame, making it look stealthy. Though the video is short and we do not have much information about the bike itself, what we see is enough for now. All you have to do is simply sit back and enjoy the view. The Harley Davidson quad bike looks utterly modern hence the front is not your usual looking quad bike. What do you think, could possibly this brand new design take over the world by storm? Before you go, check out the Harley Davidson Night Rod built by Fredy.